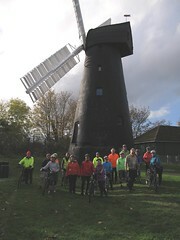 A warm Sunny day saw 19 Cyclists leave via the High St & Portsmouth Rd track, (with 1 very impatient Driver trying to wipe out the Leader on leaving the slipway carpark), Long Ditton, Hinchley Wood, Esher, (with 1 late arrival, managing to catch the tail), Fairmile, Cobham, Downside, Effingham, (despite the Road closure, 😉), White down, Abinger to Holmbury St Mary for lunch at a very hospitable ‘Royal Oak’, then Abinger Common, Friday St., Wotton, Westcott, Milton Court, Dorking, Meadowbank Park, A24 Cycle track, Norbury park Farm, to the 2nd Road closure of the day, -this one needing a bit more effort to By-pass, but a deserted Young St was very pleasant to Cycle-, to Bockett’s Farm for Tea & BP, then Leatherhead, Kingston Rd Cyclepath, the City of London’s Ashtead Common, Epsom Common, Long Grove Park, St Ebba’s path, Hogsmill path, West Ewell, Tolworth Greenway, Berrylands to Kingston. 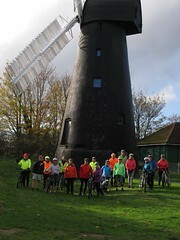 Total 45 Miles, 2 new Faces, thanks to John E for Back marking again, and many others for marking corners, thanks to Derek for the ‘Spicy’ Bread Pudding. 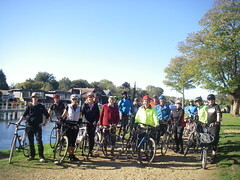 My first ride out with Kingston Cycling Campaign was a thoroughly enjoyable ride, with a lovely bunch of people. Great leader, Roger taking us on the scenic route, testing us at times with hills but taking short regular breaks meant we could take in the scenery, not to mention the picturesque pub stop. I look forward to joining the group again.